The BIB learns with regret of the death of Aubrey Holt, singer, songwriter, and founder member of the influential and respected Boys from Indiana band, at the age of 79. An appreciation appeared on Monday's Bluegrass Today. 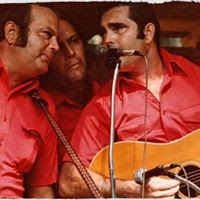 It includes a video of the Boys from Indiana singing Aubrey's most celebrated composition, 'Atlanta is burning', followed by a medley of old gospel songs. Bluegrass Today's archive of recent news about him includes this feature by Richard Thompson about the writing of 'Atlanta is burning'.